Incorporated in 1905, and named for its proximity to Whitefish Lake, the town was previously known as Stumptown for all the large number of tree stumps remaining after the founding fathers cut down the forest to make room for the new train depot. All the bothersome tree stumps were eventually removed, and the name �Stumptown� faded away to become Whitefish. During the 1880�s the Whitefish area of the Flathead Valley was uninhabited, short of a few bands of Indians who frequented the area to hunt, and fish for the native Whitefish. Today, Whitefish is a rapidly growing resort and retirement town with population approximately 6,300 as of 2010, and is surrounded by the Whitefish Mountain Resort, Glacier National Park, numerous pristine lakes and a wide variety of outdoor recreation opportunities. Whitefish is a vacation and retirement community in Flathead County, Montana. The population in 2010 was 6,357 and is home to Whitefish Mountain Resort, a ski resort on Big Mountain. Whitefish is also home of Ptarmigan Villages, and luxury condo resort. Whitefish Mountain has over 3,000 acres of mountain skiing along the continental divide. In the beginning, to enjoy the new ski mountain, local residents had to climb the steep mountain in order to ski the powder snow above the lake. Today, Whitefish Mountain Resort is ranked as one of the top resorts in the USA. The new ski resort was built in the late 1940s on Big Mountain, and the ski resort attracted tourists from across the country. Around 1904, the Great Northern Railway was built through Whitefish, and the railroad brought people and business development into Whitefish. The new train depot and several new logging companies were some of the town's earliest commerce. James J. Hill, the "Empire Builder", is well known for helping to build the Great Northern Railroad, but he's also known for his desire for land conservation. Hill believed that the land should be developed but never spoiled. Great Northern's finest train carried the name of Empire Builder. One of the most notable people to pass through the train depot at Whitefish was Elvis Presley on August 30, 1957. Elvis came to the door of his railroad car to wave to fans a few moments before his train, the Empire Builder, departed for Spokane. Presley never left the train so his fans, who were "all shook up", couldn't tell if he was wearing Blue Suede Shoes. At its peak in 2006, the rail road train depot handled approximately 68,000 passengers coming and going. Where to stay in Whitefish, Montana? Ptarmigan Village condominiums is nestled on 52 acres of beautiful Montana forest only 2 miles below Whitefish Mountain Resort on Big Mountain. The property management team Ptarmigan Village understands what makes a vacation home right for our guests. 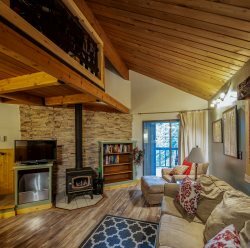 We make it our business to provide Whitefish vacation rentals of the highest quality that will exceed our guest's expectations. Have you ever wanted to know what is a Ptarmigan? A couple of notable people calling Whitefish home include professional football player, Drew Bledsoe, and former coach of the Los Angeles Lakers and Chicago Bulls, Phil Jackson.